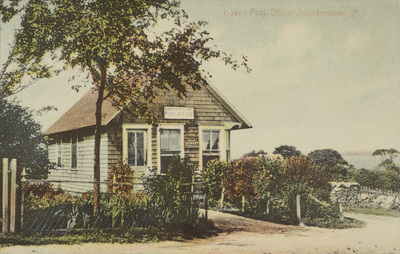 "Post Office, Saunderstown, R. I." by E. E. Briggs, Saunderstown, R.I.
Post Office, Saunderstown, R. I.
E. E. Briggs, Saunderstown, R.I.
Used. Postmark: February 24, 1912. E. E. Briggs, Saunderstown, R.I., "Post Office, Saunderstown, R. I." (1912). Rhode Island Postcards. 250.